Warm shades of yellow and red welcome you to Flavours, our signature restaurant. Open from breakfast to dinner, the atmosphere is casual - just like our Patong Beach location. The ever-changing menu brings you innovative examples of Thai and international cuisine. 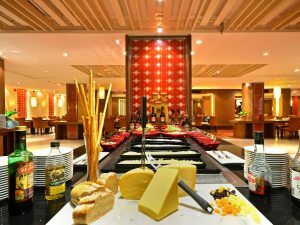 Get ready for a busy day spent exploring Patong at our tasty breakfast buffet. A la carte options use the finest local produce to recreate Thailand’s famous flavours – or to transport you to the culinary destinations of Europe and Asia. Got an early meeting or a late night date? We’re open from 06.30 to 23.00 to ensure that you never go hungry.